Call it the Kim Kardashian effect or blame it on Instagram, but we are a society obsessed with selfies, and it looks like makeup brands are taking note. The New York Times reported makeup brands like CoverGirl are testing products with selfies to make sure they hold up to our generation's exacting standards. Because nothing is worse than a selfie unworthy of Instagram, right? Selfies are ubiquitous in today's society — so ubiquitous, in fact, that you're more likely to die taking a selfie than being attacked by a shark. Yikes. As long as you're being safe while taking your selfies (read: do not walk or drive and take photographs of yourself), there's no shame in a little vanity. 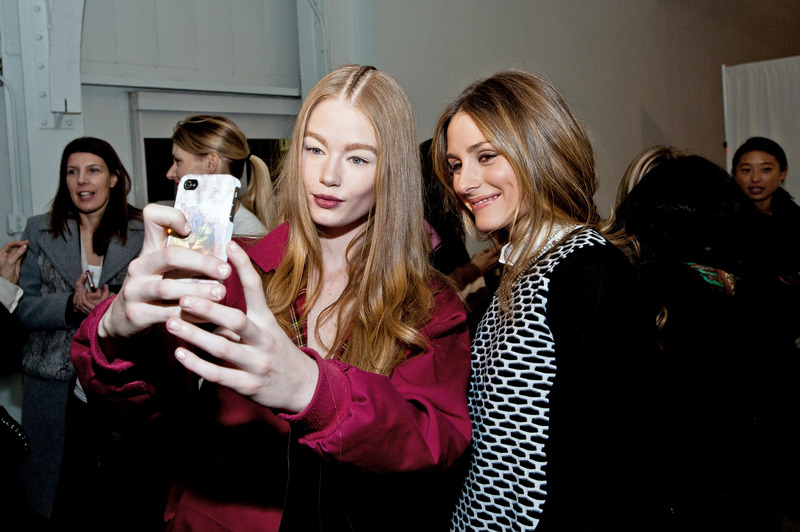 There's a million apps to help you take a better selfie, but good makeup can help, too. It's no wonder brands are jumping on board. CoverGirl's new Outlast Stay Luminous Foundation was tested in multiple lights, but scientists also tested it by taking selfies on their iPhones. The final product reduces shine, but doesn't make your face look flat. CoverGirl isn't the only company jumping on board. Smashbox Cosmetics has long been known for its Photo Finish products, which are now tested on iPhones and other smartphones as well. Here are seven products that will guarantee your next selfie looks perfect and your face looks fliter flawless. This product is a cult favorite for a reason. If you're going to be taking selfies for a couple hours, you want your makeup to stay put. This primer will keep it in place for hours. This new foundation kind of has to make the list, right? The team at CoverGirl was super dedicated to ensuring it looks perfect in every lighting situation. The name kind of says it all. This simple illuminator is going to help you "get a healthy glow in any light," according to the company. Strobing is the new contouring, and the best highlighters for strobing depend on where you'll be going. This loose powder is perfect for selfies because it can be mixed with foundation for a dewy look or used alone for something a little more matte. Mascara is all-important for a selfie, because it defines your eyes in a way nothing else can. According to the article, a mascara that coats your lashes in one swipe is ideal for avoiding the raccoon-eye look that can so easily happen. A TotalBeauty.com user says one swipe of this Body Shop mascara "'magic' wand gave me long, feathery, natural-looking lashes." Yep, I'm sold. Avon is another company that's been testing products for selfie taking. Makeup artist Luis Casco told the New York Times that dry, flaky lips are the fastest way to ruin a selfie. Bright lipsticks can be drying, so Avon developed this formula to be hyper-pigmented but still moisturizing. After you've spent all this time doing your makeup, you want it to last through a couple rounds of selfies. Make sure to set your makeup with something like this spray so it lasts all day. It's always awesome to see brands respond to cultural phenomenons, and like it or not, it seems like the selfie is here to stay. At least now our makeup products are catching up.